It's time for my 3rd annual NHL playoff predictions! My model and methodology are basically unchanged from last year, so check it out here. In the two years I've been doing this, I've learned that it's pretty hard to predict the outcome of any one series, but if we look at it from a stratification standpoint, we can gain some valuable information. This is, instead of saying, "team x has a 60% chance of beating team y", it may be more constructive for us to say, "teams w, x, y, and z are more likely than the other teams to make deep playoff runs and win the Stanley Cup." Picking individual winners is hard, but we can see which teams rise to the top. 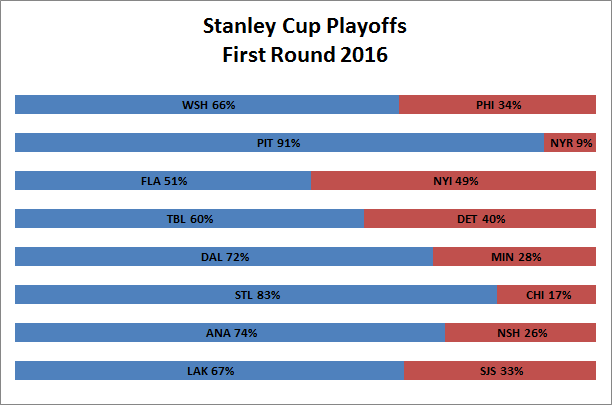 The main takeaway is this: STL, PIT, LA, ANA, and WSH are the teams that rise to the top. They are the ones most likely to go deep into the playoffs and win the Cup. I was a little surprised that San Jose, Chicago, Philadelphia came out as low as they did. These are good teams, but they have brutal paths to the Finals. San Jose would have to go through LA, then likely Anaheim and St. Louis just to get to the Final. Philly would have to go through Washington and Pittsburgh. 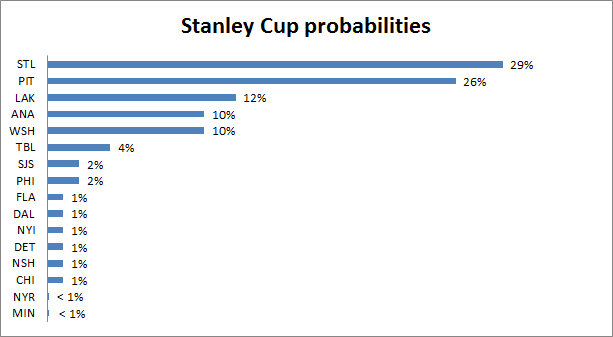 One other thing that stands out is that the model thinks that the Pens have a 91% chance of beating the Rangers. 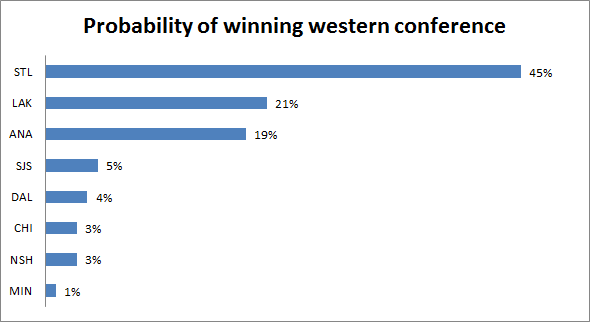 I don't think any team has a true probability of winning that is so high. The model thinks it's so high because there are only a few observations since 2007-2008 where the difference between the teams regarding score-adjusted Fenwick % (SAF) is so huge. In every series where the difference was this extreme, the team with the better SAF won the series. 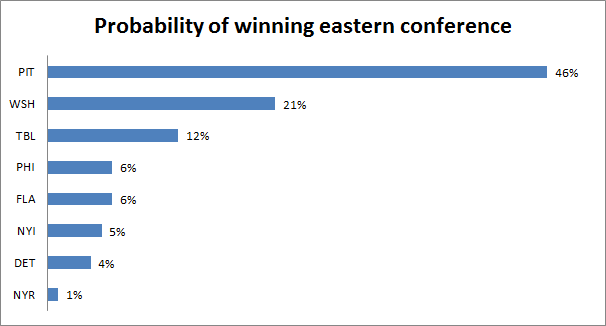 The Pens are favorites in this series, but probably not 91% likely to win.